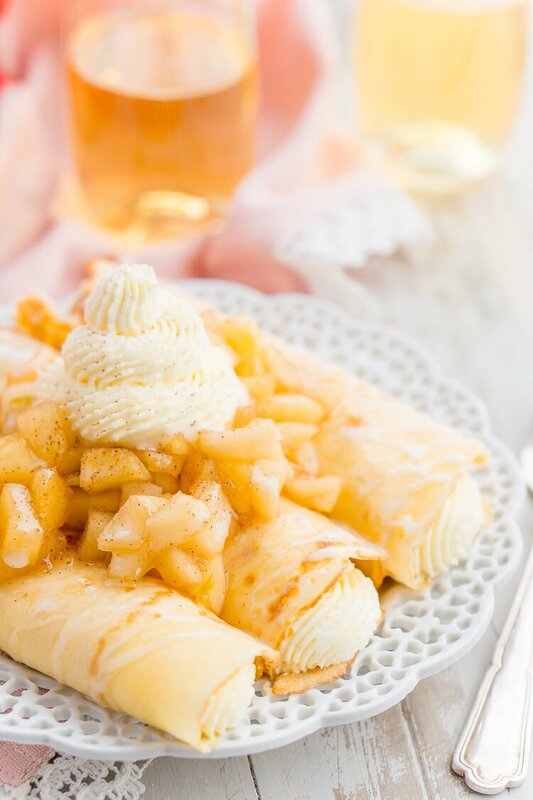 Apple Cheesecake Crepes are a fun way to sweeten up brunch or to be enjoyed as a decadent dessert! I absolutely LOVE crepes! They’re the ultimate breakfast and dessert in one, and the flavor possibilities are endless, endless, I tell ya! My favorite place to get them is a restaurant called The Island Creperie on Anna Maria Island in Florida, the savory ones are to die for, but I’ll always be true to the fruity ones! 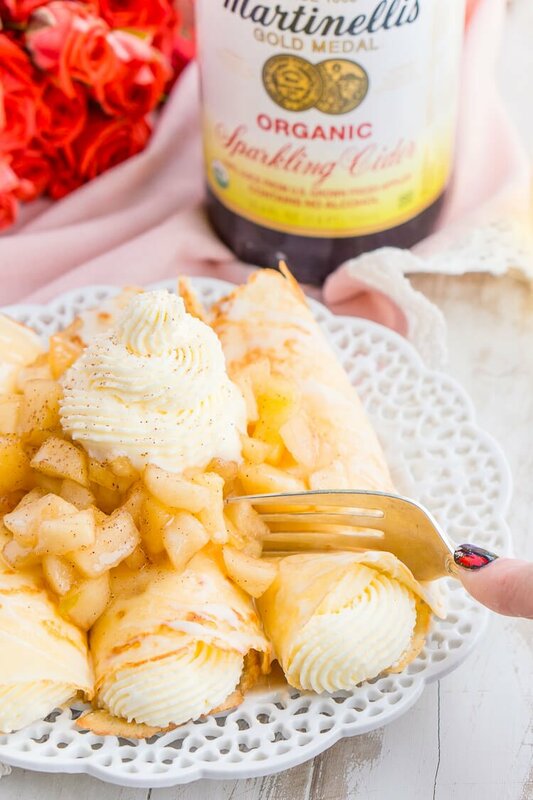 And I’m excited to have teamed up with one of my favorite brands, Martinelli’s, to bring you this sweet and indulgent recipe for Apple Cheesecake Crepes! 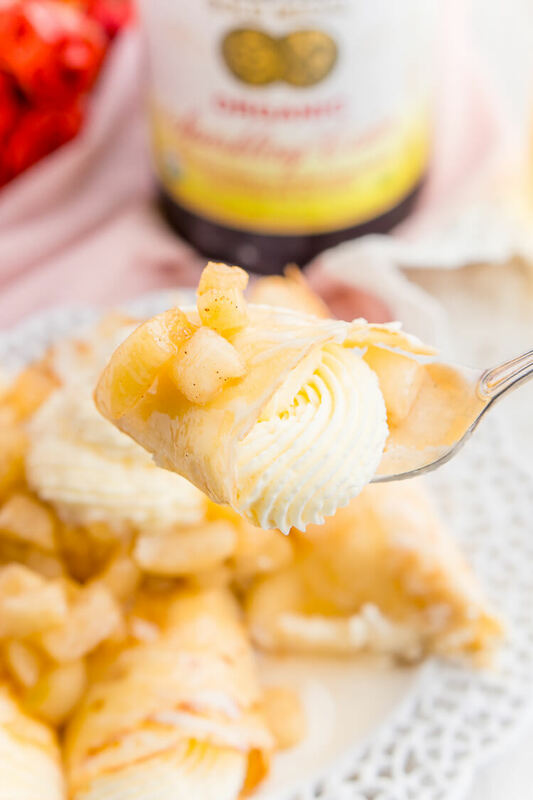 And I’m excited to have teamed up with one of my favorite brands, Martinelli’s, to bring you this sweet and indulgent recipe for Apple Cheesecake Crepes! In this dish, a soft, thin crepe wraps around a whipped cream cheesecake filling that’s fluffy and light. It’s made from heavy cream, confectioner’s sugar, and pudding to add smooth richness to every bite. 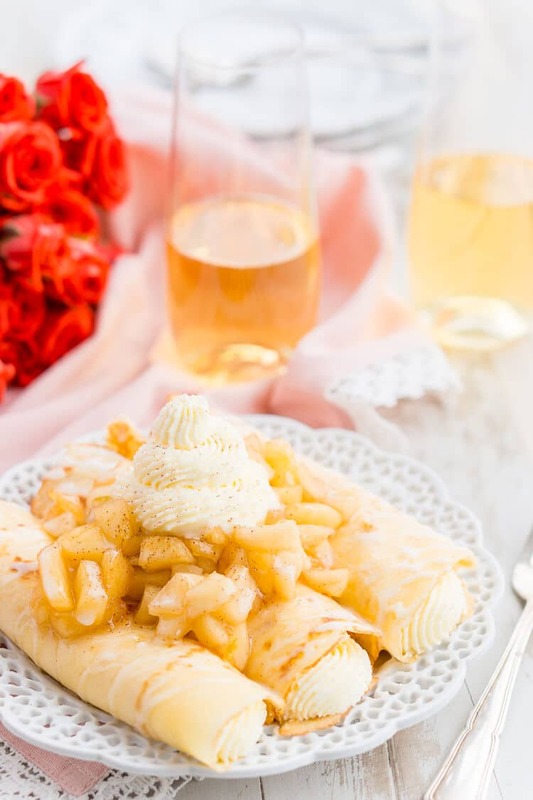 The crepes are topped with a warm scoop of luscious apples that are cooked in Martinelli’s Apple Juice with a dash of apple pie spice and brown sugar. The finishing touch is a drizzle of apple icing made with a splash of Martinelli’s Sparkling Cider. 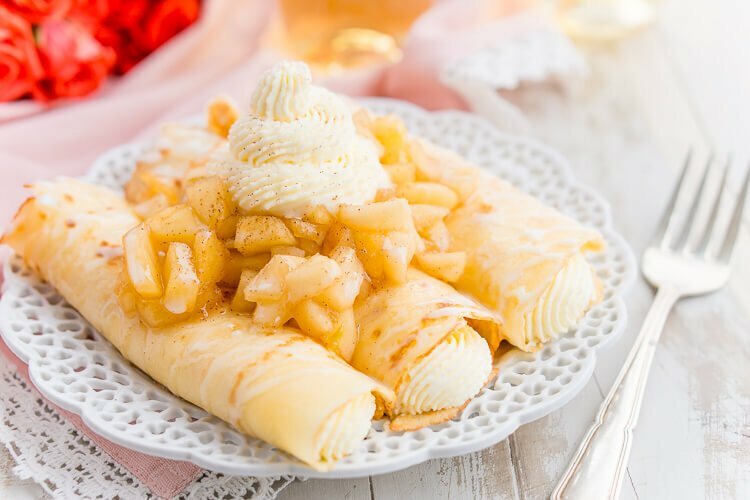 These delicious crepes are the perfect combination of elegance and nostalgia. When it comes to capturing the essence of homemade flavors, it’s important to use quality, fresh-tasting ingredients. 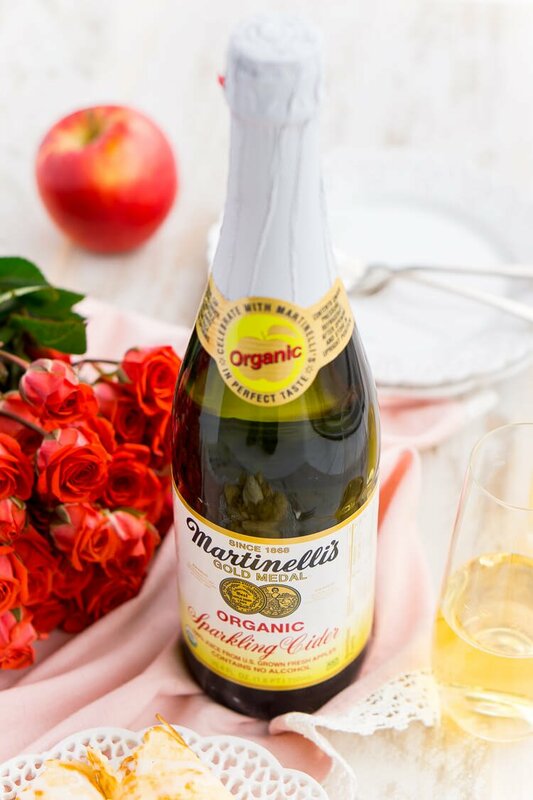 Martinelli’s Apple Juice, Cider, and Sparkling Cider are made from 100% juice from US grown fresh apples. And they have an organic blend too! I knew these products would be perfect for bringing that cozy apple flavor to life in this dish! Matt and I don’t usually go out for Valentine’s Day, fighting the crowds and waiting for tables is not our idea of romantic. So we prefer to stay in and make a special meal together and maybe watch a movie or play games. 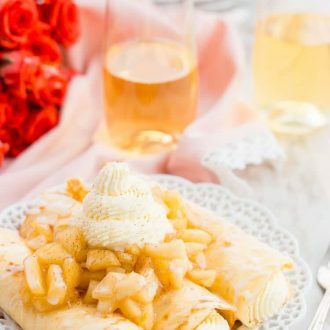 These Apple Cheesecake Crepes definitely fit the bill for a “fancy” dish to serve up for dessert or even brunch. You may or may not be planning on cooking together, but if you want to impress that special someone, this recipe will do the trick! It’s simple to make but looks sophisticated, and your date will be flattered that you made something special just for them. 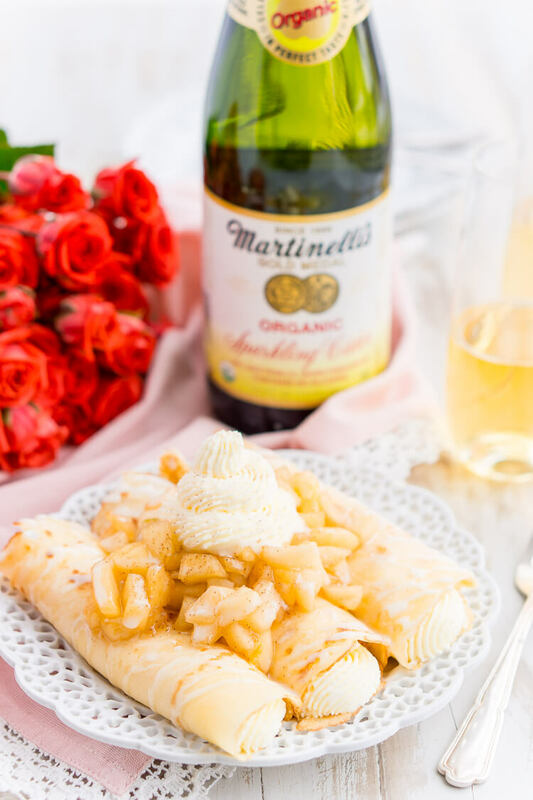 Apple Cheesecake Crepes perfectly pair with a flute of Martinelli’s Sparkling Cider for the perfect romantic treat to enjoy with your sweetheart this Valentine’s Day! Combine all ingredients in a blender and pulse for 10 seconds, make sure there are no clumps. Refrigerate for at least 1 hour and up to 48. Once the batter has set, heat a small pan over low heat and add butter. Combine all ingredients in a bowl or stand mixer fitted with a paddle attachment and beat until light and fluffy, about 2 to 3 minutes. Combine chopped apples, apple juice, light brown sugar, and apple pie spice in a medium pot. Whisk together the icing ingredients until smooth and drizzle over the top of the crepes. You got me! I love apples and crepes are the latest craze in my house! Cannot wait to try this recipe!! Ooh I might just have to make these today! Oh me too, especially when it’s cold outside! We love crepes in our house, and these sound delicious. Can’t wait to try them. Thanks for sharing this. Absolutely delicious. These look amazing! Cant wait to try them!